IN TSARSKOE SELO (“Tsar’s Village”), a smart district in Kyiv, Ukraine’s president, Petro Poroshenko, owns a swathe of desirable land. Across the street sits a sprawling compound belonging to Ihor Kononenko, the president’s friend and deputy head of his parliamentary faction. The two men met during their Soviet army service. After Ukraine gained independence they rose together in business and politics. Last week Ukraine’s economy minister, Aivaras Abromavicius, resigned, accusing Mr Kononenko of obstructing reform. Mr Abromavicius said he refused to cover for officials who, “very much like the old government, are trying to exercise control over the flow of public funds”. Ukraine’s Maidan revolution was supposed to roll back corruption and cronyism. Mr Abromavicius, a Lithuanian-born investment banker, was one of several foreigners invited into government to change the old ways. 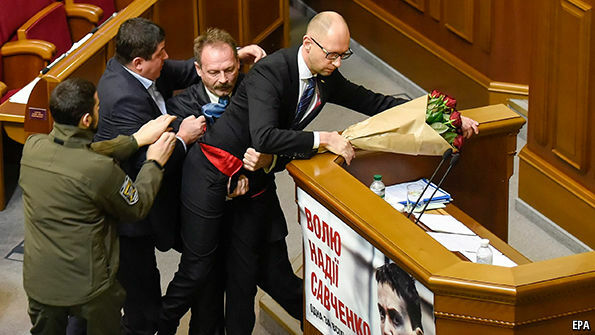 He ran up against vested interests in the circles of both the president and the prime minister, Arseniy Yatsenyuk (pictured, being uncomfortably hoisted during a brawl in parliament). Mr Abromavicius is the second economy minister since the revolution to quit for similar reasons, and the fifth minister to resign from the current government. Western ambassadors lamented his departure. In unusually blunt language, Christine Lagarde, the head of the International Monetary Fund (IMF), threatened an end to Ukraine’s $18 billion bail-out programme “without a substantial new effort to invigorate governance reforms and fight corruption”. Following Ms Lagarde’s comments, Mr Poroshenko pledged to do more. Yuri Lutsenko, the head of Mr Poroshenko’s parliamentary bloc, says the country now faces a “full-blown political crisis”. A cabinet shake-up is inevitable. A collapse of the ruling coalition and early parliamentary elections look increasingly likely. Ukraine’s Western allies argue that elections would be destabilising and open the door to radicals and populists. Yet an exasperated public may demand them. At stake is Ukraine’s chance of moving past its history of post-Soviet misrule. Figures like Mr Kononenko abound in Ukraine’s parliament; locals call them “grey cardinals” or lyubi druzi (“dear friends”). The lines between friends, business partners, relatives and political allies are blurred, says Mr Abromavicius, and reforms have stalled. “It’s not a technical problem, it’s a political problem,” says one foreign adviser to the government. Dissatisfaction with the country’s direction is rising and trust in the authorities is falling (see chart). Not a single government institution has a positive trust rating, according to the Kyiv International Institute of Sociology. Investors are worried, says Tomas Fiala, the head of Dragon Capital, Ukraine’s largest investment bank. Bond yields have spiked in the past week. On February 16th Mr Yatsenyuk is set to present his yearly progress report to parliament. A vote of no confidence may follow. Political stakeholders have been scrambling to prepare. Mr Poroshenko summoned the ambassadors of the G7 nations for a meeting, hoping to regain their trust. Mr Yatsenyuk gathered his cabinet to push for a last-ditch attempt at unity. Young reform-minded deputies are holding cross-party strategy sessions. The central bank chief summoned the heads of the top 40 banks for a dour meeting earlier this week. Western diplomats have been urging calm, concerned that instability could derail both Ukraine’s reforms and the Minsk peace process. Sensing weakness in Kyiv, the Kremlin may be rocking the boat: last week saw an uptick in ceasefire violations and snap drills by the Russian army along the border with Ukraine. The crucial question is the fate of Mr Yatsenyuk, who is reviled but controls a large faction in parliament. Although he and Mr Poroshenko are partners in public, insiders say the president wants the prime minister out. 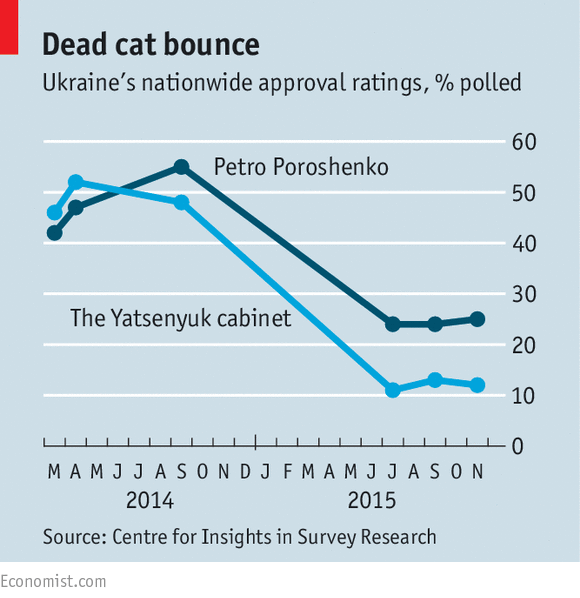 About 70% of Ukrainians also want Mr Yatsenyuk gone, but there is no consensus on who should take his place. The American-born finance minister, Natalie Yaresko, is favoured by some reformers, including Mr Abromavicius, yet she has expressed no interest. Two old hands, Yulia Tymoshenko, a former prime minister, and Mikheil Saakashvili, the ex-president of Georgia who is now governor of the Odessa region, do have designs on Mr Yatsenyuk’s seat.